The angle of elevation is the angle that the line of vision makes with the horizontal line, if the object is above the line of vision. When the object is below the line of vision, then the angle that the line of sight makes with the horizontal is referred to as the angle of depression. Angles of elevation and depression are typically used with questions involving the trigonometric ratios. The angle of elevation from a person 1.56m tall to the top of a flag pole is 44°. If the person is 10m from the pole, what is its height? 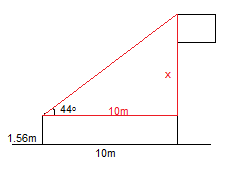 In order to solve the question, the diagram must isolate a triangle. The question provides enough information in order to use the SOH-CAH-TOA relationship to solve the length of x. 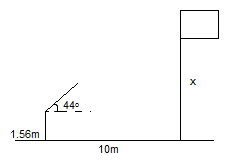 However, the question asks for the height of the whole pole. In that case, the height of the person must also be added. 9.7+1.56 = 11.22m. The pole is 11.2m high. A pilot is flying an aeroplane 700m above sea level when he spots a small boat 1070m from him. Find the angle of depression. 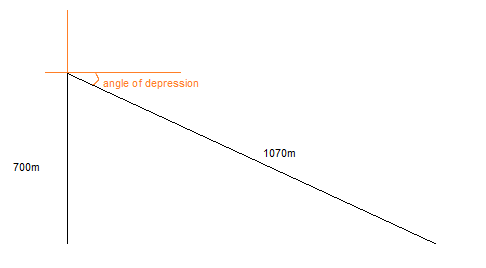 To figure out the angle of depression, the angle between the two solid, black lines should first be determined. This can be done using trigonometric ratios. Since the angle of depression is being seeked, this number is subtracted from 90 in order to find the angle the line of sight makes with the horizontal in the direction below.